As you may be aware, the weather forecast suggests there may be snow over the next few days affecting parts of the country. If this causes disruption to traffic and public transport then we may well have to implement our snow day procedures as a number of staff live a considerable distance from school. Therefore, we are sending out our snow procedures in case this area is affected. If a large quantity of snow falls but the site is safe, then I would like to keep both school sites open as far as possible. Although many members of staff live a considerable distance away, our policy is to ask them to travel to school if they consider that it is safe for them to do so, even if this means coming into school later on during the day. We will inform you when your child’s teacher arrives by school ping and/or school website. You will then be able to bring your child/children to school if you are able to do so safely. If you are unable to get into school please do not worry about your child’s overall attendance rate. All absence due to adverse weather is coded as an authorised absence and as a result your child’s attendance rate will not go down. Please do not telephone the school before 9.00am at the earliest as it is unlikely that staff will have arrived by then. Please remember – children must not come to school until you have been notified that their teacher is on the premises. Take extra care when entering the school as the caretaker may not have had time to fully grit all areas. The Schools Meals Service has advised that they will arrange staff cover, if necessary in order that we are able to provide a hot meal. If the weather deteriorates during the day then we may have to take the decision to close the school. If so, we will school ping and/or send an email and/or telephone parents who we have contact details for and Heart FM will be informed. Please listen for updates. We will also update our school website. If you feel the weather is worsening and are concerned about collecting your child at the end of the school day, please feel free to collect earlier. Although these arrangements will not suit everyone in these circumstances, I cannot accept pupils into school if the class teacher is not present, for health and safety reasons. I do apologise for any inconvenience this may cause you. If the school has to be closed to all pupils due to events beyond our control i.e. no heating or electricity, we will send out school pings, emails & update our website. In addition we will inform Heart FM (102.4 – 103.5 FM). It is difficult to write a letter that covers all eventualities but I hope that by giving you notice of our intentions, child care arrangements can be made for those of you who need it. 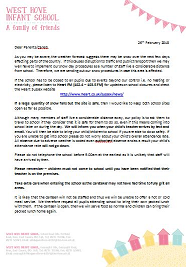 This letter only applies to severe weather conditions, if there is a sprinkling of snow, all children will still be expected to attend school. If you do not receive a school ping/email early in the morning and there is no information relating to our snow procedure on the school website, please bring your child to school as normal. In the first instance we will always try to contact you via school ping. If this service is temporarily unavailable we will update our school website. Please check here if you have not received a school ping before 7.30am.